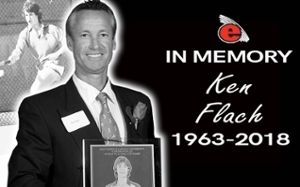 Ken Flach, a 2008 inductee to the SIUE Athletics Hall of Fame, has passed away at age 54. According to ubitennis.net, Flach passed away due to complications with Bronchitis and pneumonia. Flach, who came to SIUE from Kirkwood High School in St. Louis, captured three consecutive individual NCAA Division II singles titles from 1981 to 1983. As a teammate, he won two NCAA Division II doubles titles in 1982 and 1983 with different partners and advanced to the finals with a third different partner in 1981. After leaving SIUE, he joined SIUE teammate Robert Seguso to capture four Grand Slam titles professionally with two at Wimbledon (1987 and 1988) and two at the U.S. Open (1985 and 1993). He also won a mixed doubles Grand Slam at the French Open and Wimbledon. Flach was inducted into the St. Louis Tennis Hall of Fame in 1998. Flach and Seguso, who represented the United States in Davis Cup play from 1985 to 1991, also won a gold medal at the 1988 Olympic Games in Seoul, South Korea.